October 2, 2017 – Gordon & MacPhail already has the world’s oldest single malt Scotch Whisky on the family-owned firm’s 122-year-old resumé – a 75-year-old Mortlach single cask released in 2015, along with two 70-year-old bottlings from Mortlach and Glenlivet. 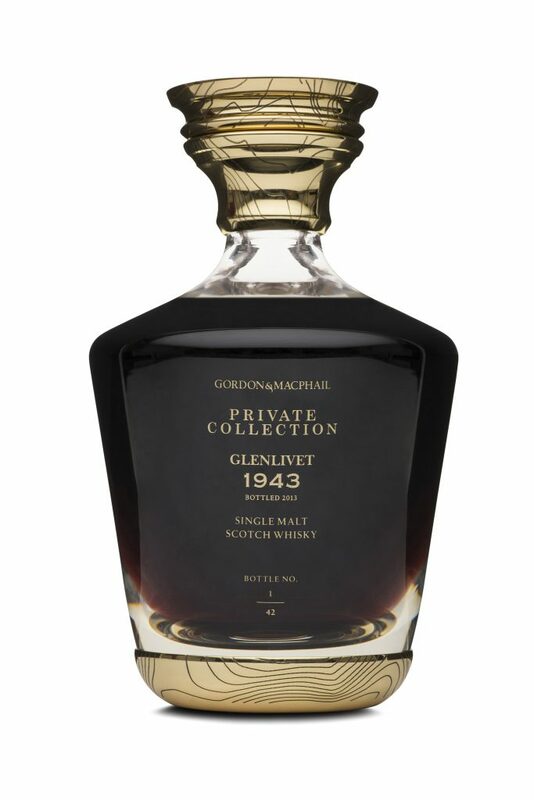 Now, Gordon & MacPhail has added a second 70-year-old Glenlivet single cask to that vintage lineup with the release of Private Collection Glenlivet 1943. Just 40 bespoke decanters will be available worldwide, with a recommended retail price of £30,000 GBP ($39,780 USD) each. 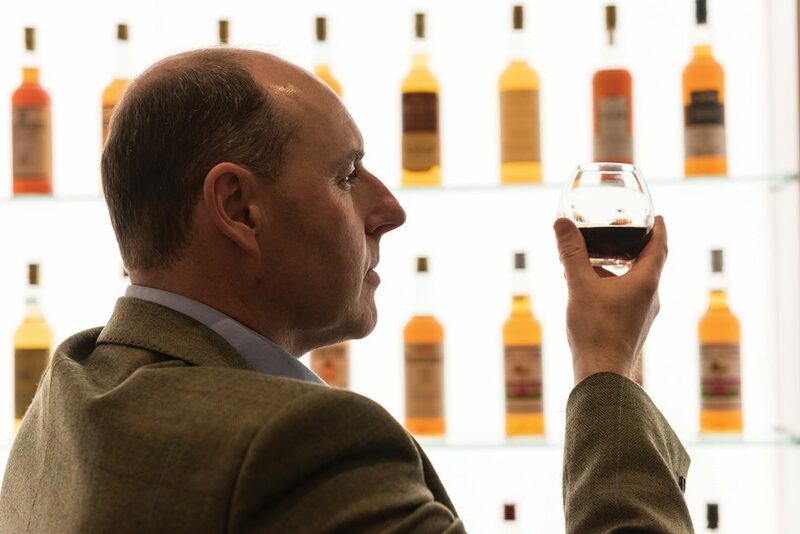 “While it’s not the oldest whisky in the world, it is obviously incredibly special due to its place in time,” Gordon & MacPhail director Stephen Rankin told WhiskyCast’s Mark Gillespie in a telephone interview. “It was distilled on the 14th of January in 1943, at a time when the world was a completely different place…it was a place of uncertainty, a place of risk, and every decision was key.” One of those decisions was the British government’s move to ration barley supplies for the war effort, which forced most of Scotland’s distilleries to close in 1941 and 1942. Glenlivet was one of the final distilleries to remain open until it closed for the duration of the war in the spring of 1943 after its supply of grain ran out. The cask comes from Gordon & MacPhail’s own inventory of barrels it has had filled with new make spirit at many of Scotland’s historic distilleries for decades, and that played a key role in its survival over the decades. The wartime closings meant distillers and blenders faced a shortage of aged whisky from that period during the 1950’s and 1960’s, and many companies blew through their stocks of mature whisky to meet the post-war demand. “For anything to have lasted beyond the demands of the industry into the 60’s would have been almost unheard of,” Rankin said. His great-grandfather, John Urquhart, had originally arranged for this first-fill Sherry cask to be filled at Glenlivet as part of a parcel of Gordon & MacPhail casks, and it was stored in a warehouse at the distillery until 1967, when Rankin’s grandfather had it moved to the company’s own warehouse in Elgin, Scotland. Rankin, part of the family’s fourth generation to work at Gordon & MacPhail, selected the cask for bottling in 2013 and had the barrel emptied into an inert container for storage until today’s release. Unlike many extremely old casks, in which the alcoholic strength of the whisky has declined to a point dangerously close to the legal minimum of 40% ABV (after which it can no longer be bottled as whisky), the whisky in Cask 121 retained much of its strength, and was bottled at 49.1% ABV. “It’s still got the wonderful structure of the spirit, but there’s still a wonderful complexity that’s been driven from the oak,” Rankin said. 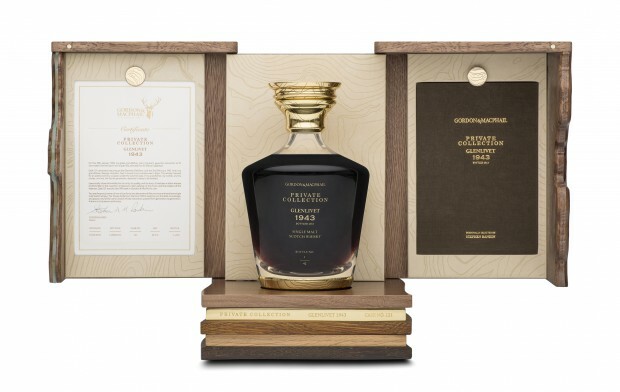 The Private Collection Glenlivet 1943 will be available through select whisky specialist retailers worldwide, along with Gordon & MacPhail’s own retail shop in Elgin. Buyers there will have the opportunity to receive a exclusive tasting of the whisky from a 1cl sample bottle in the shop’s private tasting room.